As no two women's bodies are alike, we want to provide you with as much information as possible to help you choose the right fit. Below is the size chart we used when developing the sizing of our styles. Please use it only as a rough guide as we know most women won't have the exact measurements/proportions as below. You can refer to the sizing notes in each product page for help deciding which size is best for you. If you have more questions, feel free to send us a message with your bust, waist, and hip measurements and the style(s) you're interested in and we'll recommend the best possible size. Bust 81cm / 32" 86cm / 34" 91cm / 36" 96cm / 38" 101cm / 40"
Waist 61cm / 24" 66cm / 26" 71cm / 28" 76cm / 30" 81cm / 32"
Hips 87cm / 34" 92cm / 36" 97cm / 38" 102cm / 40" 107cm / 42"
For more fitted tops and dresses, usually the bust and waist measurements are the best measurements to go by when deciding a size as those tend to be the most variable. However, be sure when deciding on a size that the sweep, sleeve, and bicep measurements also leave enough room between yourself and the shirt to allow for movement. For our more fitted styles, we suggest leaving at least a few centimetres between your bust measurement and the bust measurement of a shirt. Same goes for the waist measurement. It's important that there is some room between the shirt and your bust to prevent the dreaded "gape" between buttons when too tight. For more relaxed styles, we recommend leaving at a minimum 10cm between your bust measurement and the measurement of the shirt, and even more for the "boxier" styles or if you like a looser fit. For example, if your bust measures 92cm, choose the shirt size that is at least 102cm in the bust. For fitted styles, the difference can be smaller. Or, if you have a great fitting shirt at home, take its measurements and match to ours. Hopefully ours will be close! Start out by laying the garment flat on a surface. Measure from the highest point on the shoulder (not including the collar) all the way down to the bottom edge of the garment. From 1" below the armhole seam, measure across from edge to edge. Be sure to double it to get the full bust measurement. From the bottom of the side seam, measure across from edge to edge then double it. On the sleeve from 1" below the armhole seam, measure a perpendicular line upwards to the top edge of the sleeve then double it. Start from the center of the back of the neck then bring it along the top of the shoulder all the way down the outside of the sleeve to the bottom edge of the cuff. 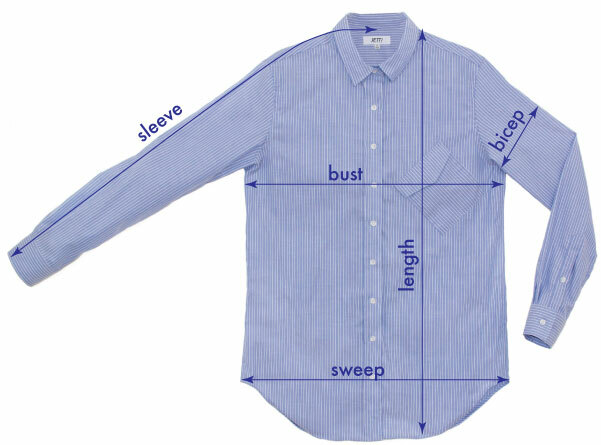 We take our sleeve measurements this way rather than measuring from the shoulder seam as this gives a more accurate idea of where the sleeve will fall.